We tell our new clients that the newsletters we design for them will be completely unique. Part of being unique is making a personal connection with your reader. Here’s our best advice about how to make your newsletter more personal and distinct. 1. Write a personal introductory note. Share news and give teasers for the content to follow. Inject your personality. Your writing may be more informal here. 2. Insert your signature as a graphic. Sign a blank piece of white paper and scan it - first name only. Use a pen or marker that matches your branding. 3. Use a good photo of yourself. You want this photo to look like you now, not 5 years ago. Dress as you would when you meet contacts in person. Incorporate your brand colours into your clothing if possible. Keep in mind that the direction you are facing in your photo will determine where it goes in your newsletter, you don’t want to be facing off screen. 4. Use your own photos. Instead of common, often overused, internet photos, create your own. If you can design, create your own graphics. This may not be as easy as other suggestions but it definitely makes your newsletter unique. 5. Use appropriate branding. Your newsletter should be easily identifiable as coming from you. This means it shouldn’t look like anyone else’s newsletter. If it does, see #6. 6. Incorporate a unique layout and design. Consider the types of content and space requirements when designing your first issue. Incorporate space for ‘standard’ items, such as contact info, social media icons, photos, testimonials, and quotes. The key is to make each segment or piece of the newsletter fit nicely into the whole. 7. Send it from your own email address. People will open mail from a person more than from an info@ address - especially if they have a rule which sends info@ emails to their spam folder. 8. Write your own content. One thing you can write about that no one else can is your own experiences and interpretation of them. If you are an expert at what you do, you will have opinions that are unique too. 9. Have a clear vision and strategy for your newsletter. This will affect the success of all those items listed above. 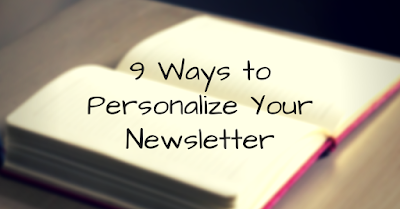 If personalizing your newsletter is appropriate, include these tactics into your strategy. Here is a worksheet to help you strategize.